No Baking Soda. No Propylene Glycol. No Aluminum. Bye-Bye, Bad! Deodorants don't have to be filled with unpronounceable ingredients to work. Nandi's Naturals All-Natural Deodorants prove that. Most all-natural, handmade deodorants are full of BS--baking soda, that is. While baking soda is excellent at fighting odor, too much of a good thing may cause mild to severe irritation in some users. If you are seeking reliable odor protection without the irritation, our deodorant roll-ons pack a whole lot of odor-fighting punch, in a non-irritating, non-staining, easy-to-apply formula. One bottle can offer up to two or more months of use, and is safe and gentle enough for the entire family to use. We guarantee that if used correctly, our deodorant will control your odor--if not, we'll be happy to replace it with another scent. All we ask is that you pay shipping for the replacement deodorant. Contact us for more information on deodorant replacement. ALWAYS shake well before EACH USE. Glide onto underarms. Spread with fingers for even coverage and to help deodorant dry quicker and dissipate whiteness. Washes off hands with soap and water. Only apply to clean underarms. Remove old applications, before applying a fresh layer. SPECIAL NOTE: You'll notice that your deodorant is a milky white. This is due to the presence of zinc oxide. Many of our volunteer testers found that rubbing the formula in with their fingers helps to "activate" the deodorant and decreases the whiteness. You'll notice that the whiteness also fades during the course of the the day. None of the ingredients in our deodorants are meant to prevent sweating, as this is a deodorant, not an antiperspirant. The purpose of deodorant is to minimize or eliminate body odor, not prevent perspiration. Because our deodorants are made from natural products and contain no preservatives, it is important that you take into account the shelf life. We recommend that you use all deodorants within 4-6 months of opening and within 12 months from date of purchase. Ensuring a safe, natural product means using safe, natural ingredients. Do keep in mind that simply because something is deemed safe or natural does not mean it will not and cannot cause allergic or sensitivity reactions in certain people. Prior to using any new products on your body, we suggest reading product ingredient labels in their entirety and conducting a sensitivity test. Maintain the freshness and effectiveness of your deodorants by keeping them out of extreme heat and direct sunlight. This will also help prevent clogging of roll-on balls. One of the first things you may notice when switching to a natural deodorant is that you sweat under the arms . . . a lot. This simply means your underarms are doing what they're supposed to do and pores aren't blocked--all of which make for healthy underarms. Perspiration is a natural human function, because it helps the body to rid itself of toxic accumulations (although some might argue that). Many people have seen all the commercials and been convinced by them that underarm perspiration is offensive, will lose you the job, the date, the girl, whatever. Don't raise your arms, if you're not SURE! But there's good news--for many, the days of heavy perspiring tends to decrease as your body adjusts to non-antiperspirant deodorants, especially with good diet and adequate hydration. 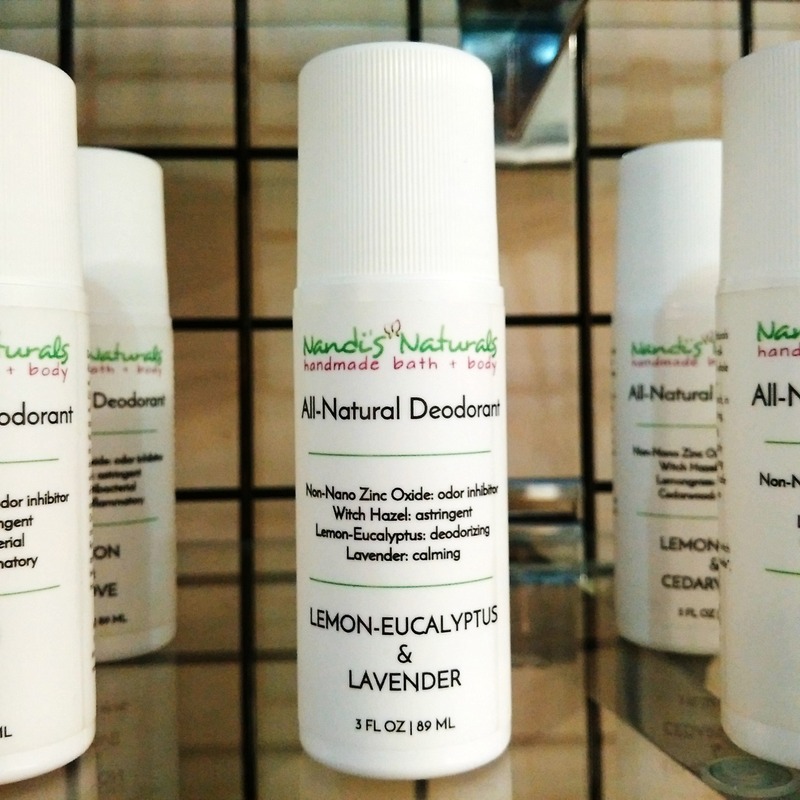 One of the most frequently asked questions regarding natural deodorants is do they work? Well, we can't answer for those of others, but we do know that our deodorants work. How do we know that? Because we use them every day. Whether we're hiking, biking or just kicking up our feet with a bowl of coconut milk ice cream. To be sure that we're not an anomaly, prior to marketing our deodorants to the public, we asked friends, family, people around the country, and even the UPS guy, to try it out. All of them gave us glowing reports on its effectiveness. We're so sure our deodorants will work for you that we're willing to jump through hoops to make sure you receive the one that's right for you! If ever you feel your deodorant is not living up to its name when it comes to controlling odor, simply phone or e-mail us, and we'll do what it takes to make sure you're satisfied--even if it means refunding your purchase price (minus original shipping charges). Do you offer custom scents and formulas? Unfortunately, we don't at this time, but with the many scent options we already have available, we're sure you'll find one that's right for you. Still have questions? Feel free to contact us if you need assistance deciding which deodorant might be best for you. Nandi's Naturals lists ALL ingredients ALL the time, and we never test on animals, unless they're of the consenting human persuasion.